Is it an owl? Is it a log? No, it is a Frogmouth! There is a bizarre species of bird that lives in Australasia and across SE Asia that would be entitled to enter any competition for strangest looking bird; the members of the frogmouth family. 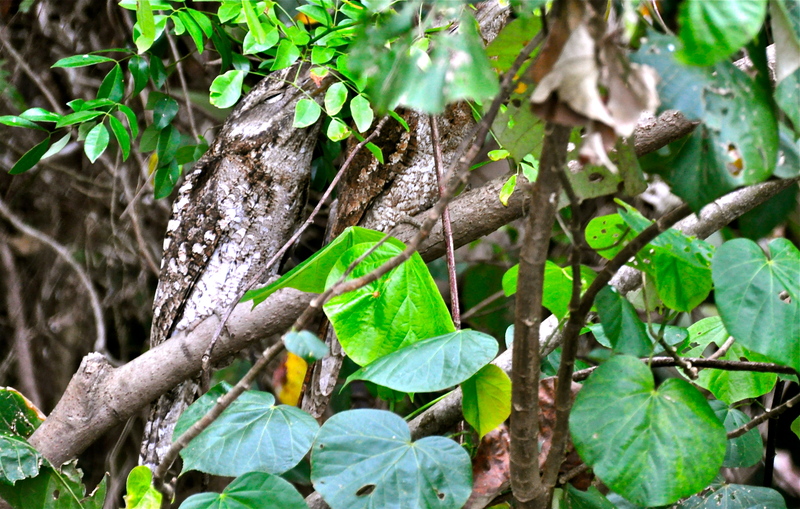 Frequently confused for owls due to its mottled, camouflage plumage and nocturnal hunting lifestyle, more like a large nightjar in shape but most often overlooked as an old dead tree branch. 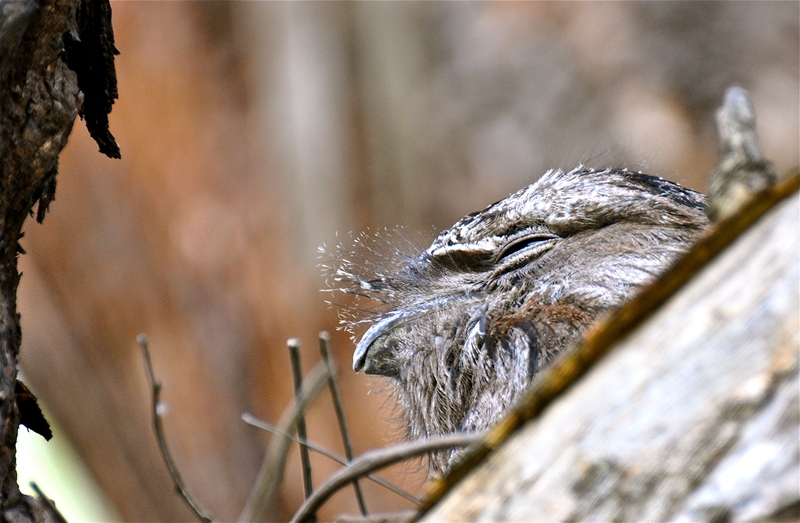 The frogmouth gets its name from its huge mouth that is concealed by a powerful beak. It is a night predator that feeds on hard shelled insects as well as small rodents, amphibians and reptiles. Indeed, anything that moves that fits into its out-sized mouth. Unlike an owl, the frogmouth has small, weak feet, so uses the powerful, hooked beak for hunting. The Tawny frogmouth is a square shouldered, large headed, pigeon sized bird at 32-46 cm that is widespread throughout Australia, and can been seen in daylight, in city parks and gardens, with a trained eye and/or access to local knowledge. Lachlan’s Swamp in Sydney’s Centennial Park is a great place to start searching, but if time is short then look to join a morning bird walk. I photographed the birds in these pictures at Illawarra Fly Tree-top walk in New South Wales, about an hour-and-a-half south of Sydney. Here there is a breeding pair, that often nest close enough to the tree-top bridge to give those of us who carry a camera with a modest zoom (80-300mm) a sporting chance. I was fortunate enough to be there in the nesting season and managed to grab a shot of the female on the nest, as she stretched her head above the branch that concealed her. 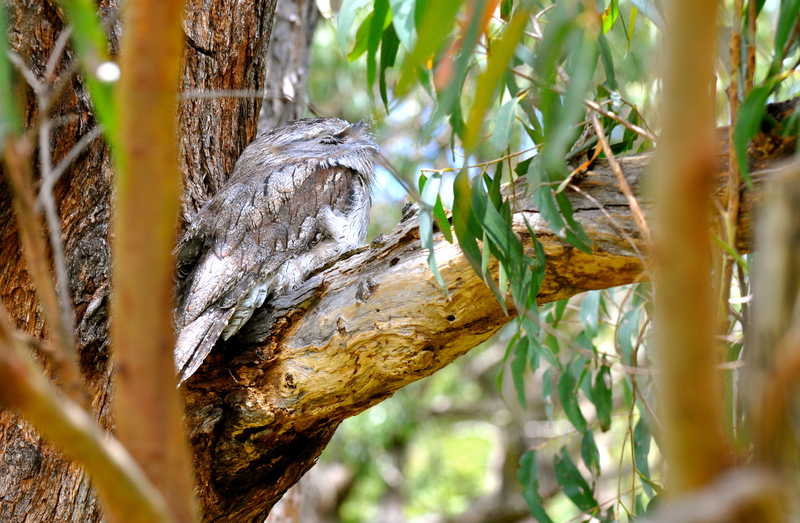 Tawny frogmouths form life partnerships and may use the same nesting sites for over 10 years. 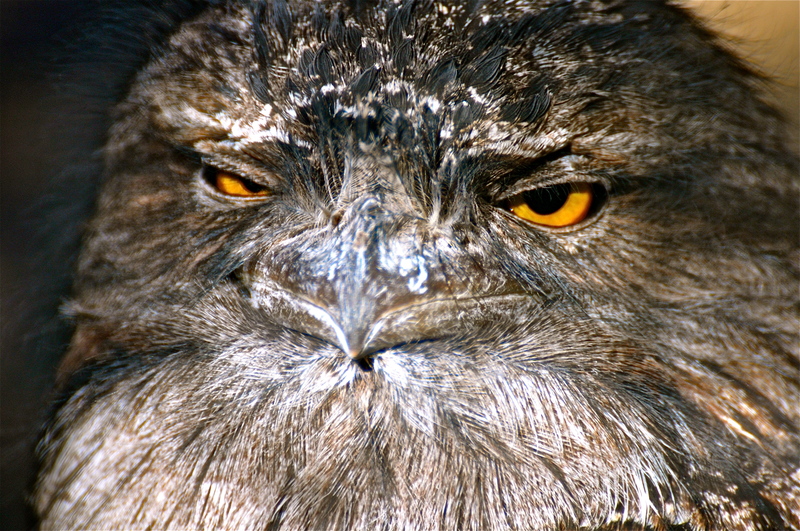 There are 3 species of frogmouth in Australia (14 overall). I was privileged to be able to photograph two of them. The Papuan frogmouth is the largest of the species at 45-54 cm, and lives only in tropical far north east Queensland, from Cape York down as far as Townsville. I photographed them along the Daintree River, which is a fairly reliable area for spotting them, with help from a local guide. There are several guides offering their services and boat at reasonable rates, for an early morning trip. Look for the red eyes as a distinguishing feature of the Papuan species. Daintree is a birder’s paradise, certain to get you a few more rare sightings such as the Little kingfisher and Victoria’s Rifle bird. These weird looking and yet strangely attractive birds are a fantastic addition to any birders check-list, and with just a small amount of effort can be spotted, incidental to a family trip to the park, or a wander around green spaces during evenings or weekends as part of a business trip. If you enjoyed this post, please follow Incidental Naturalist. Help others to connect with wildlife experiences by sharing this post on social media. I am a wildlife blogger and world traveler, using images & stories to inspire wild connections. Oh gosh your work is amazing! Thank you for introducing me to a species I had never even heard of before! Great pictures of creatures, too!